You've just been forced out of your position at a company your family founded and has run for generations. You don't want to say anything you'll regret later but you're clearly steaming. What do you do? If you're Charles Morgan you just go nuclear using Twitter's retweet function to let others say what you think you can't. Morgan appears to have been forced out of his position at Morgan Cars, the British sports car company that's been in his family for more than a century and is famous for making antiquatedly awesome cars . He hasn't, however, been too hostile based on what he's been tweeting so far this week — but his retweets say much more. Morgan has been relatively civil in his own comments about his forced departure. But he's been retweeting the shocked, outraged and disgusted tweets by other people about this new Morgan-less Morgan. 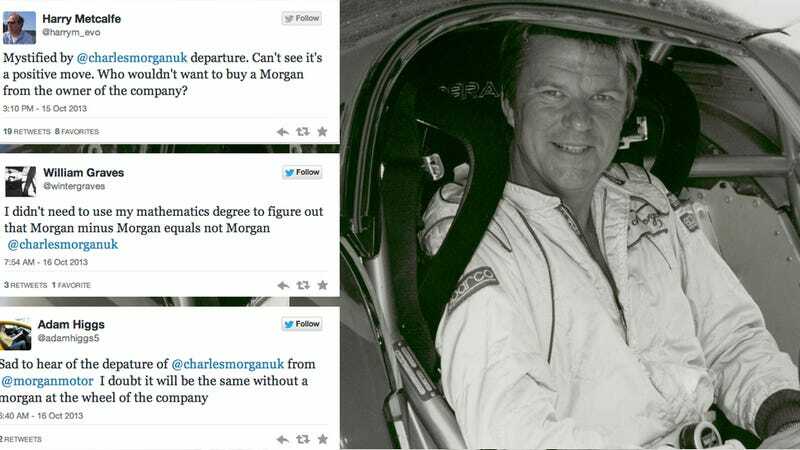 Charles Morgan is a beloved figure in the automotive world. Few automotive executives would get such a passionate level of support after leaving the company under shady circumstances. But then, Morgan isn't a normal car company. This looks like just the tip of the ash-tipped frame in the Charles Morgan saga. Stay tuned.